The Roman Anglican: Charles I and Charles II: two monarchs, two exhibitions. Charles I and Charles II: two monarchs, two exhibitions. If you happen to be in London at any point before the first half of April, you might want to visit a pair of two superb exhibitions: Charles I: King and Collector at the Royal Academy of Art (27 January - 15 April 2018) and Charles II: Art & Power at the Queen's Gallery in Buckingham Palace (8 December 2017 - 13 May 2018). Focusing on some of the most controversial monarchs of British history, these two events are absolutely complementary and truly allow us to see the man behind the Stuart king. The first exhibition on Charles I spaces over several rooms and it gives us a perspective on the superb sense of taste of that king, very much in line with continental standards. Perhaps the most misunderstood monarch Britain ever had, has, throughout the years, and because of small-minded historians, received a very bad reputation; that of a monarch who tried to overthrow parliament and not of the monarch who tried to prevent England from becoming the brutal theocratic and military dictatorship it was under Oliver Cromwell's Commonwealth, not the monarch who tried to save the historical apostolicity of the moderate and by then Baroque, high Church of England of Archbishop William Laud; a monarch but also a martyr of temperate convictions whom Anglicans still regard as a martyr. The exhibition focuses on the hidden side of King Charles, an immense taste for art but also a deep understanding of how art was a symbol of power. The monarch's taste ranged from the highest forms of humanist Renaissance and Mannerist art, both Italian and Netherlandish/Flemish but also to the then contemporary Baroque style which expressed both emotion and power equally in dramatic ways. The glorious cycle of the Triumphs of Caesar by Andrea Mantegna truly shows the political intention behind acquiring such works; others such as Titian's Last Supper, Rubens' Peace and War or the astonishing Mortlake Tapestries after Raphael, show the monarch's knowledge of the great names of his times as shown in actually owning some of those masters' most impressive works and also the relative broad taste of the king of what was essentially still a turbulent post-Reformation country. Indeed, King Charles I's court master was none other than Anthony van Dyck, perhaps the greatest portrait painter of the 17th century and throughout the exhibit his depictions of Charles I in all poses from the Charles I in Three Positions to the impressive Equestrian Portrait of his are absolutely exceptional. Indeed, the former was in fact made for sculptor Gian Lorenzo Bernini, who kept it for years in his Roman palazzo, before sending the king a bust on behalf of Pope Urban VIII Barberini as a sign of friendship and respect, a work also displayed in this show. A Stuart monarchy was a stable and respectable form of government for the English and a nation to be respected and admired throughout the continent. The show just proves this throughout its many rooms. But in 1649 the King's collection was scattered throughout Europe, following his shameful beheading at the hands of the Puritans, it was divided mainly between the Prado in Madrid and others - finally this event reunites such glory here in London. He was the first modern art collector and commissioner among Britain's monarchs. His last words were: I go from a corruptible to an incorruptible Crown, where no disturbance can be, no disturbance in the World. The second exhibition on Charles II takes on the story following the quick demise of the Puritan Commonwealth that Charles died trying to prevent from taking power; it all starts with a poignant portrait of Charles I on the day of his trial, only a shadow of his former past glories. Following those dark years of iconoclasm, strict societal rules, and during which the royal collections were sold - Britain boomed into its Baroque renaissance with the Restoration. 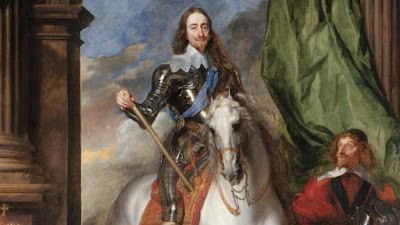 Not only, Charles II was the son of Charles I but he also managed to inherit his father's taste in art and managed to reimagine it in accordance with the return of the monarchy. The Puritans destroyed all the necessary regalia for the Coronation, including the spectacular Mass-set and Charles had them all recommissioned in a grander way for Westminster Abbey, a wonderful gilded set that is on display at the exhibition. After over a decade of republican rule, all ritual and courtly life were reinstated, art patronage resumed - art that seems to be rejoicing in the glory of the Restoration: the Monarchy is back! 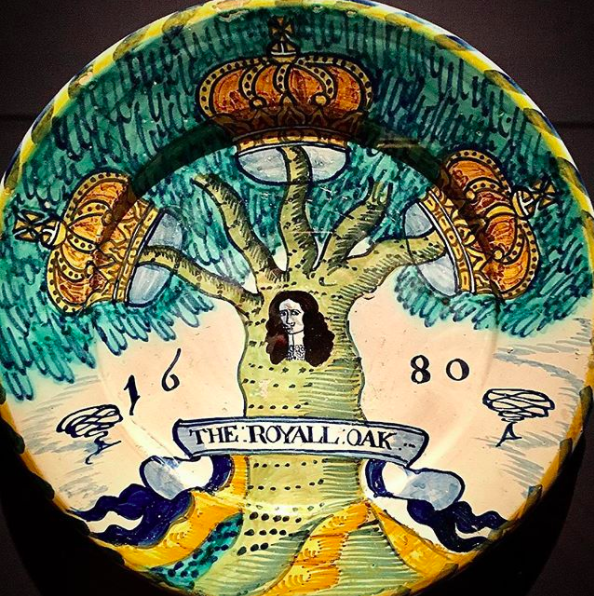 Indeed, the English people realised republicanism was a bad idea and many remained loyalist, the exhibition begins with objects used during the Commonwealth as symbols of loyalty to the Crown: these include devotional books with prints of Charles I, the martyr King, or plates that were hung in homes with portraits of Charles II. There are several pamphlets and prints showing the horrors and violence of the Commonwealth and the contrasting decency of monarchical rule. And suddenly it truly begins, a series of prints and portraits showing the return of the king, either enthroned, on a horse or other significant poses, and not a random king, but Charles II, who commissioned some impressive paintings and portraits himsef, enlarging the Royal Collection with spectacular works, such as Peter Brughel the Elder's Massacre of the Innocents or Orazio Gentileschi's Sibyl - not to mention the precious jewellery, the beautiful prayer books and Bibles or the stunning drawings by Leonardo or Italian Mannerist masters such as Polidoro da Caravaggio or Parmigianino - some of the greatest Italian artists of the time. 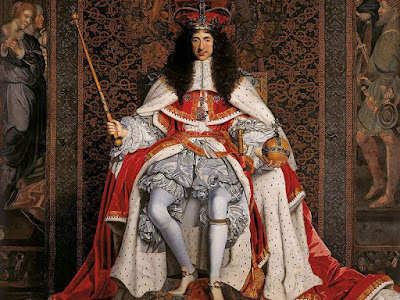 Charles II not only followed his father in appreciating beautiful humanist continental Renaissance or Baroque art but he also used it as a mean of power and propaganda as well. In the exhibition are two of his royal portraits: one is by an Italian master, Antonio Verrio, The Sea Triumph of Charles II, and it represents the monarch as a classical god emerging from an intricate pattern of beautiful human and animal bodies emerging from the seas in a scene of true eccentric and Baroque triumph; the second being a more conservative portrait by John Michael Wright which sees the monarch loosely sat on a throne surrounded by draperies held by Italian-looking-like spectators, King Charles II stares into the public's eyes, holding the sceptre and orb, symbols of religious and temporal power, slightly smiling and spreading the legs of that richly decorated, sacred body which seems to communally claim, with a certain pleasure, that we are back, we are here to stay. This exhibition is not only a wonderful example of a show on the grandeur of the British monarchy, but it represents that grandeur itself through a clever act of refined propaganda. Why? The show takes place in the Queen's Gallery at Buckingham Palace, in both exhibitions most works were given by HM Queen Elizabeth II. It all continues... God save the Crown! I highly suggest you to see the two complementary exhibitions and experience the troubled history of these two great monarchs through some of the highest forms of beauty ever produced by mankind and that these two kings could indeed see and appreciate.